In a telling response to the highly concerning discovery that Monsanto’s genetically modified alfalfa ended up contaminating a ‘GMO-free’ crop harvest, the USDA went on record in declaring that the genetic contamination was perfectly normal and not any of their concern. In fact, the USDA went on to say that there are measures in place to ‘minimize’ the widespread contamination of Monsanto’s genetically modified crop, and that’s all that’s required. What the organization is saying here is that it doesn’t matter if GMOs are contaminating ‘GMO-free’ crops, and it doesn’t even seem to matter that the very integrity of the international food supply is being mixed with genetically modified crop varieties. The agency tasked with keeping our food supply functioning safely even says that it’s really a ‘marketplace’ issue. A marketplace issue? The agency tasked with handling specifically this subject in its entirety is telling us that it’s our problem and we need to just deal with it ourselves. That’s highly irresponsible of the USDA at the very least, but of course in reality it has much more to do with the fact that the USDA is under the deep influence of biotech juggernaut Monsanto. Why do you think that, as I told you back in February, the USDA is giving special ‘speedy approval’ to Monsanto on its new GMO crop varieties? Why would the agency offer an even ‘speedier’ approval process than the already abysmal safety process that has been blasted by scientists and consumer organizations? And as Monsanto receives an extra helping hand of corruption, farmers around the United States attempting to grow GMO-free crops are being thrown out of export deals due to GMO contamination. 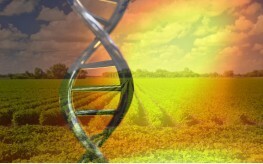 GMO contamination that will ultimately suffocate the entire industry if something isn’t done. It looks like the agency in charge of agriculture and its preservation is perfectly fine with that. Looks like our government is trying to kill us all. Don’t let them! Vote them all OuT!! I’ve been voting and signing petitions since the Vietnam war. Result: worse and worse. Hello Anthony. Thanks for all of the information you provide. After a lot of personal research into the USDA, FDA, Monsanto, GMO’s and the pertinent players and effects of same it comes to mind to ask what qualifications must one have to be a 1. farmer 2. an FDA or USDA policy maker. ? Food production and consumption are the indicators of the future we are leaving behind for the next generations. Genetics is a brand new science. For anyone to make a declaration of absolute safety concerning GMOs, for instance, is a statement of absolute ignorant arrogance. Those who produce them are destroying the fertile earth and isolating the chemical compounds of life that are neither alive nor interacting within the sterile foods that carry them. They are pure chemistry and have no place in the food chain which is kept intact by life itself, not chemistry. Shameful. Health crimes against American citizens. this is the plan “morons” wake up!!!!!!!!!!!!!!!! I’m more than awake. Now what? The “Justice” Department Now Considers the Banksters Foreclosure on the Free World Normal. How do we get rid of the incompetent people in office? Just like they think they understand chemistry, while they turn the Earth into a toxic dump. They make themselves rich, and the Earth and its people poor! Humanity needs thoughtful action, not wild freedom–which is what we have. They think they understand genes. I think they are tots in a sandbox! But their sand is toxic to all life! It’s true that “genetic engineering”, “nuclear engineering” and “geo engineering” are all infant technologies, but tots are naive. This industry is anything but naive and is using our gut as their laboratory. In other words, they take full advantage of OUR naivete. For the mutation industry, human health is not just a low priority, it has no priority whatsoever. The U.S. government is deluded and ignorant regarding GMO’s. Scientific BLINDNESS. A crime against nature. Money rules those creeps, our government. We must take our government back. Don’t need a government … only a Republic !! Their simply going by what all the tests say and what farmers are asking for.